See the most beautiful creatures you've ever seen in your life. Watch, in fascination, a myriad of mating rituals. Eat breakfast next to a wild beast having his night's hunt just a few feet away from you. 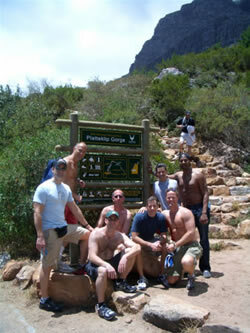 And, that's just the gay scene in Cape Town! 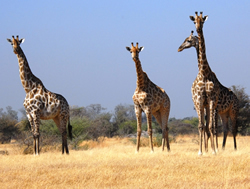 You also get to experience a 4 day all-inclusive safari in your own 5 star luxury chalet. It seems like everyone you know has been on a safari. Now it's your turn! Enjoying a gourmet dinner under the African sky and stars after an exhilarating safari is something you will take with you the rest of your life. 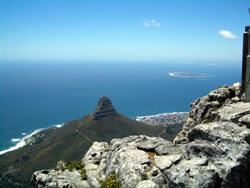 Once in Cape Town, you will be amazed by the beauty of the city, its fun beach scene, and attractive, active nightlife. 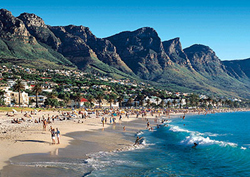 In fact, The Travel Channel named Cape Town's Clifton Beach one of the world's best beaches! 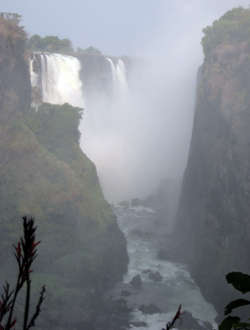 During your visit to Victoria Falls, one of the natural wonders of the world, you will see the great power of water, firsthand. 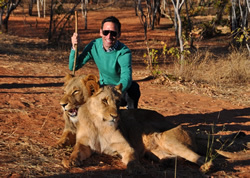 From wine tours to exotic game drives, to the finest Accommodations, Zoom Vacations will give you the time of your life in Cape Town, in world-famous Victoria Falls, and in Kruger at a safari you will never forget! Oh, and be sure to bring an extra travel bag. The dollar still goes far in Southern Africa, and the fine local crafts will bring out the "shopper" in anyone! Limited to a small group of guests, Zoom South Africa embodies all the elements of a perfect Southern Africa vacation: the beaches and nightlife of cosmopolitan Cape Town, the delectable wine country, the exhilarating Big Five game viewing at Kruger National Park from the terrace of your deluxe tented chalet or a Range Rover, bustling Johannesburg, and stunning Victoria Falls, one of the Seven Natural Wonders of the World and a UNESCO World Heritage Site. Plus, your dedicated Zoom Concierge is there to make sure your trip is nothing short of spectacular. You will enjoy the best hotels and custom activities you have come to expect from a Zoom Vacations trip. 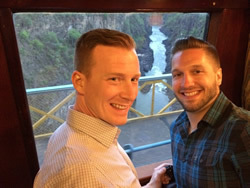 Learn for yourself why Zoom Vacations was voted favorite small tour operator by the readers of Out Traveler Magazine and voted Best Small Tour Operator by PlanetOut. • Fully escorted with the services of a Zoom Vacations Concierge throughout the trip. 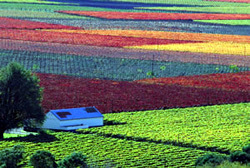 • Wine tasting in the vineyards of Wine Valley with a gourmet lunch! • Accommodations at the 5 Star Silvan Safari Lodge, in Kruger National Park. 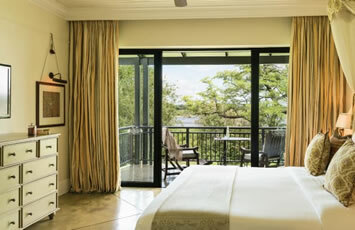 • 5 Star Accommodations in The Royal Livingstone Hotel right on the Falls! • Sensational cocktail party in a surprise location. 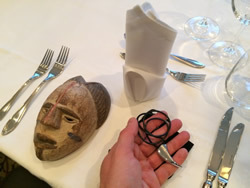 • Elegant "bush" dinner on the banks of the Zambezi River. At our final night event, we explore the bush via elephant back, and arrive at a private dinner outside on the banks of the Zambezi river via lantern light. You will be entertained through the night with live African song and dance. Arrival in Cape Town. 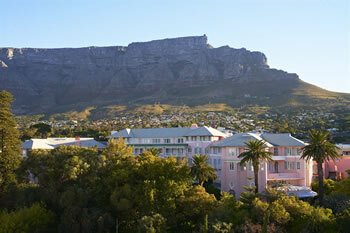 Transfer in a Mercedes sedan to the Incredible Belmond Mount Nelson Hotel, Cape Town. Cape Town's history goes back almost 400 years. Located at the base of majestic Table Mountain, at the tip of Africa, Cape Town is a dynamic and cosmopolitan city of abundant natural beauty. 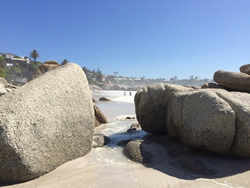 Blessed with some of the most beautiful golden beaches in the Southern Hemisphere, Cape Town enjoys year-round sunshine and a Mediterranean climate. 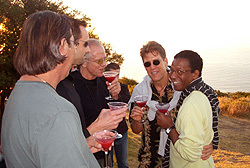 Join us for a welcome cocktail reception and dinner at one of the best restaurants in Cape Town. Taste of Cape Town city tour with our own personal expert guide, including visits to Table Mountain by cable car to see a panoramic view of the city, stunning Kirstenbosch Botanical Gardens, the world-class Two Oceans Aquarium which showcases the incredible diversity of marine life found in the Atlantic and Indian Oceans. We end at the Victoria & Alfred Waterfront marina and shopping complex to explore this cosmopolitan shopping playground. Evening is at leisure to explore one of Cape Town's fantastic restaurants, and its nightlife. 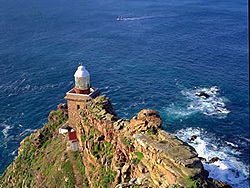 Depart for a full day experience to the Cape Peninsula and the Cape of Good Hope Nature Reserve, an area known for its beautiful scenery. 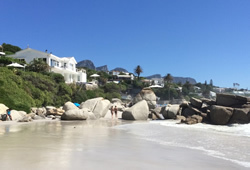 We travel along False Bay and stop at Simonstown to visit Boulders Beach, home to the endangered African penguin colony. 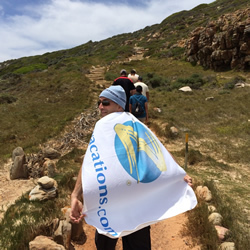 We then head to Cape Point Nature Reserve and have some time to view the general geographic spot where it is said the two great oceans meet, and maybe even see the beautiful Bontebok, an antelope found in South Africa and Lesotho. On our way back, we stop for lunch at a gourmet restaurant personally recommended by none other than celebrity chef Art Smith. 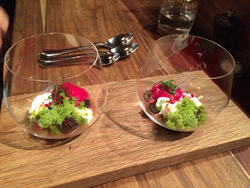 Evening is at leisure to explore one of Cape Town's fantastic restaurants. In the morning, we take a short driver to South Africa's famous Wine Valley, for a wine tasting experience with and expert sommelier and unforgettable lunch at one of the most famous gourmet restaurants in all of Africa. 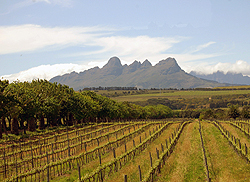 It boasts expansive views of the wine valley vineyards, and even carries its own private wine label. 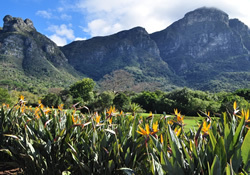 We will have some time to walk through the charming wine village of Franschhoek and do some shopping in the numerous boutiques, confectionaries, and craft and antique shops before heading back to Cape Town. Airport transfer for flight to Kruger National Park. 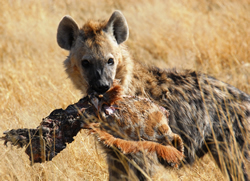 Arrival in Kruger National Park and transfer to our incredible luxury safari lodge experience, which we have exclusively chartered for our group. Silvan is grounded in the breathtaking natural elements around it, the inspirational trees, our beautiful bee-eater, the incredible wildlife and the charismatic people who bring her story to life. These are the distinctive ingredients which make Silvan tick and which brings that characteristic magic to the entire Silvan experience. After check-in, relax in your deluxe tented chalet or by the swimming pool before afternoon tea. 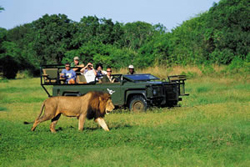 You are also invited for a late afternoon game drive before dinner. Light Breakfast at the Lodge. 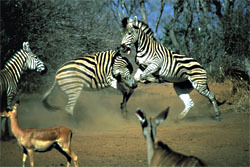 Wake up at dawn and depart for your second game drive to catch the animals you may have missed the day before. 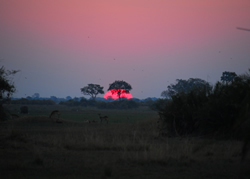 The morning is one of the best times to see animals as they wind down their nighttime hunting, as well as understanding the process of nature waking up – the grass is fresh and humid, the birds are singing and the impalas are grazing along the plain. Buffet Breakfast at the Lodge. Return to the Lodge for Buffet Breakfast. 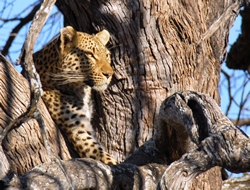 Rest of morning at leisure to enjoy a cat nap, the pool, and even game viewing from the comfort of the lodge! A light lunch is served. Relax by the swimming pool before the afternoon game drive. Tonight we will offer an exclusive pre dinner performance. 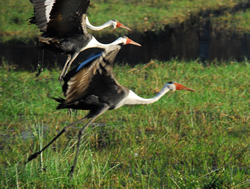 Bring your camera, and watch as the beauty of Africa unfolds before you. 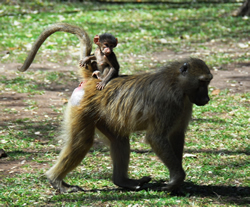 Today, we will experience a range of game viewing, including an early "Bush Walk" with your professional game ranger. Bush Walks include informative chats about grasses, trees, wild flowers and animals. 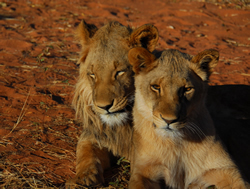 You will return to the Lodge and are free relax by the swimming pool before the afternoon game drive in a Range Rover for a game drive and bush walk with your professional game ranger, in the late afternoon when the day cools down. Before you depart, however, you will have time to enjoy some tea or coffee and local patisseries. 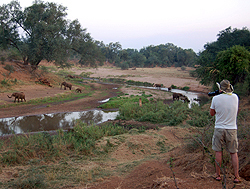 Perhaps you may want to enjoy a cocktail in the bush and you can enjoy the tranquility of the nature while your professional game ranger helps you look for the animals. 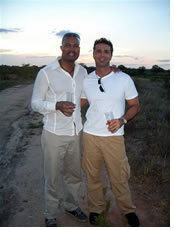 Back at the lodge they are preparing a sumptuous dinner to be served under the African sky and a million stars. 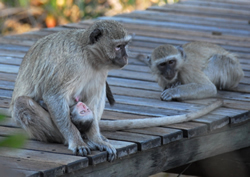 Wake up at dawn and depart for your second game drive to catch the animals you may have missed. 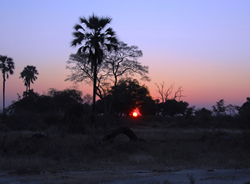 The morning is one of the best times to see animals as they wind down their nighttime hunting, as well as to understand the process of nature waking up – the grass is fresh and humid, the birds are singing and the impalas are grazing along the plain. Tonight, we celebrate our safari experience with a special gala dinner. 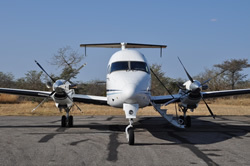 Land transfer to the airport for flight to Victoria Falls. Upon arrival we will be transferred to the hotel by water taxi. 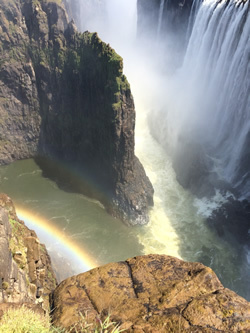 Afternoon cocktails overlooking Victoria Falls and private guided tour of Victoria Falls with a local expert on both this UNESCO World Heritage Site and the person who "discovered" them, David Livingstone. 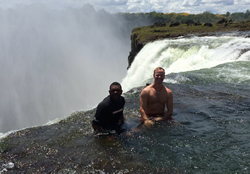 Optional white water rafting trip on the mighty Zambezi River Gorge, considered one of the world's greatest whitewater rafting adventures. Get ready for a very wet and adrenalin filled day. The rapids are all grade 4 and 5, making for big white water. Calm pools of water separate the rapids, perfect for catching your breath and admiring the spectacular scenery around and above you. 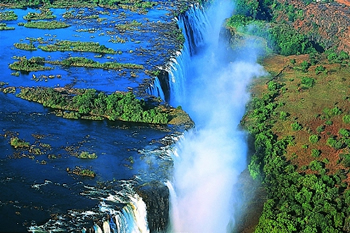 Alternatively, if you prefer to fly rather than raft, you may choose take a helicopter ride above the falls and rapids of the Zambezi River. This is an experience to remember. 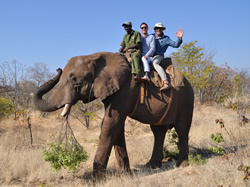 This afternoon, enjoy a unique safari through the African bush, all from the heady heights of your own African elephant! 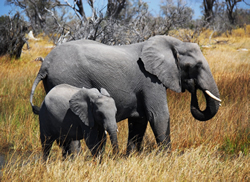 Upon arrival, you will be introduced to your induna (elephant carer) and the elephants themselves. 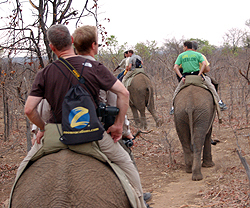 On mounting the elephants the safari begins – view game while riding game, savoring the experience of crashing through the African bush atop a gigantic pachyderm. Bring your camera! 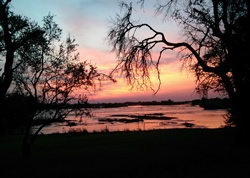 Tonight, we have prepared a special farewell dinner on the banks of the Zambezi River which blends African tradition, nature, and authentic cuisine in an ethereal atmosphere. A Zoom Signature Event, just for you, our guest! Note: this event is weather-dependent, and may be substituted for a different but equally magical event. Transfer to airport in time for the domestic flight to Johannesburg to make your international flight back home. Nestled on a lush garden estate in the heart of the city, this luxurious hotel is an icon of Cape Town and committed to excellent 5-star quality and service. Just a stone's throw from Company Gardens, the Belmond Mount Nelson Hotel is a tranquil oasis in the bustling city centre. Enjoy the hotel's famous afternoon tea on the terrace or have a swim in one of the pools. Extensive wellness facilities, including a tennis court, ensure a truly memorable stay. Each of the Belmond Mount Nelson's accommodation wings has its own character, with private gardens and facilities. Order in room service and take in the elegance of your room. Marble bathrooms and specially designed furniture make each unit an exclusive retreat after a long day. Silvan is redefining luxury safari in Africa and our inspirational Leadwood and Jackalberry forest provides the ideal canvas for this ground breaking lodge. The contemporary, modern architecture is slick, bold and alluring with a nuanced bohemian flair adding a sense of whimsical artistry. Our flittering hero, the bee-eater, introduces vibrant bursts of colour throughout the lodge and gently weaves its magic into grand art collaborations and intricate hand-woven masterpieces alike. A Silvan safari is centred around a complete celebration of unique and exceptional experiences. Our mindful approach honours the intricate manner in which all life is connected. From witnessing the unrivaled spectacle of the African sunrise, feasting on sensational culinary delights to connecting with the heart and soul of Silvan, our extraordinary people. Silvan is like nothing ever seen before, a wonder waiting to captivate the heart and connect it to the glorious African spirit. Silvan itself is a unique experience - curated by the imagination, accentuated by nature. Architectural elegance optimises the design aesthetic behind each of Silvan’s 6 unique suites. Drawing inspiration from numerous indigenous species of trees found around the lodge, we have intertwined elements such as their name, form and colour into the splendour of every suite. From the noble knobthorn to the enigmatic cassia, each suite’s design is bespoke and offers individually handcrafted masterpieces throughout. Artistic brilliance has been incorporated in every detail, enticing the eye to explore every minute aspect of the suite. For the more discerning traveller in search of luxury, extravagance and sheer indulgence, there can be no better place than the Royal Livingstone Hotel. 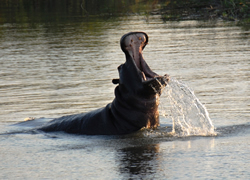 Set in the lush riverine belt and touching the banks of the great Zambezi River, this earthly paradise provides a serene haven at the most magical place in Africa. 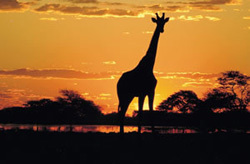 It's a place that will ignite your heart and soothe your soul, where you can enjoy the incredible majesty of Africa and witness one of the greatest natural wonders of the world. The Royal Livingstone Hotel captures the charms of a bygone era, indulges your every fantasy and enables you to experience a new level of utter comfort and sophistication at the Victoria Falls. 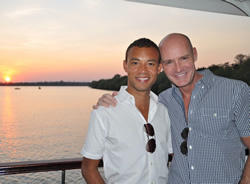 The Royal Livingstone will immerse you in the romance and style of a bygone era. 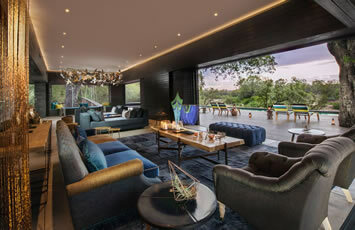 Bathed in the shade of Acacia trees, the raw splendour of the bush blends perfectly with luxurious living. Luxuriate in the sophisticated harmony of antique and ethnic décor, superb cuisine and personalised service. Every detail of this 5-star luxury hotel captures the opulence and elegance of times gone, while echoing the stunning diversity of the African bush. 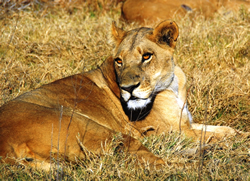 Frequently asked questions, specific to our trip to South Africa. Do I need a visa to travel to South Africa? 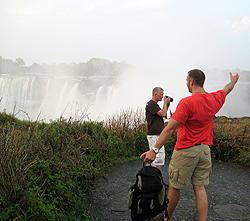 If you are traveling from the States, you will not need a visa to travel to South Africa, but you will need a visa to travel Zambia, where we will visit Victoria Falls. Zoom Vacations will obtain your visa for you. Into which airport do I need to fly? You need to fly into the Cape Town International Airport (CPT). Give us a message, and we will help you book the correct flights. Out which airport do I need to fly for my return? Ideally, you should fly out of Livingston (LVI). The other option is to fly out of the Johannesburg International Airport (JNB) which is a 1.5 hour flight from Livingstone. Give us a message, and we will help you book the correct flights. What day should I depart my home country? You must depart your home country for arrival into Cape Town on September 20th. Travelers departing the States will usually leave the evening of September 19th, but this depends on your individual routing. Can Adonis Holiday & Zoom book extra days for me at the beginning or end of this trip? Absolutely! Simply let us know the amount of days you need at the beginning and/or end of the trip, and we will book the nights you need (additional room night charges will apply). If I am traveling as a single, does Zoom offer a roommate pairing program for South Africa? 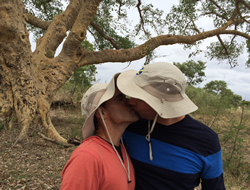 Because of the limited spots on our South Africa trip, we cannot guarantee a share will be available. However, we can place a temporary reservation for you, and advise you when we have another single in need of a roommate. May I travel as a single without a roommate? Absolutely, you may travel as a single and pay a single supplement, which varies depending on your time of booking. 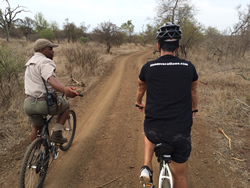 How do we get from Safari Lodge to Victoria Falls and then to Cape Town? 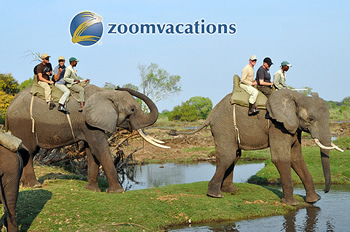 Zoom Vacations will book flights throughout South Africa and Zambia. Flight prices vary depending on time of booking. What is the fitness level required for this trip? 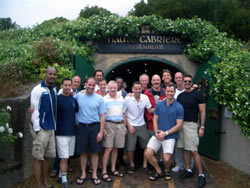 This trip is easily accessible to a variety of fitness levels. None of our included activities require a high degree of athletic skill. However, your optional activities will give you the opportunity to make your vacation as active and/or adventuresome as you choose. Land only Introductory rate, based on double occupancy. Prices are subject to change. Need a roommate? 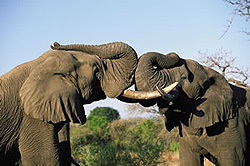 Zoom Vacations is happy to match you with someone, at no additional charge. Or, you may pay a single supplement and go as a single. • Rates are per person based on double occupancy and do not include airfare, and trip cancellation insurance, subject to change up to confirmation. • All information is subject to change without notice.